I’ve been a little busy lately and haven’t had the time to create like I normally do. We have a new family member in the house. No, not a baby. A puppy. His name is Max. 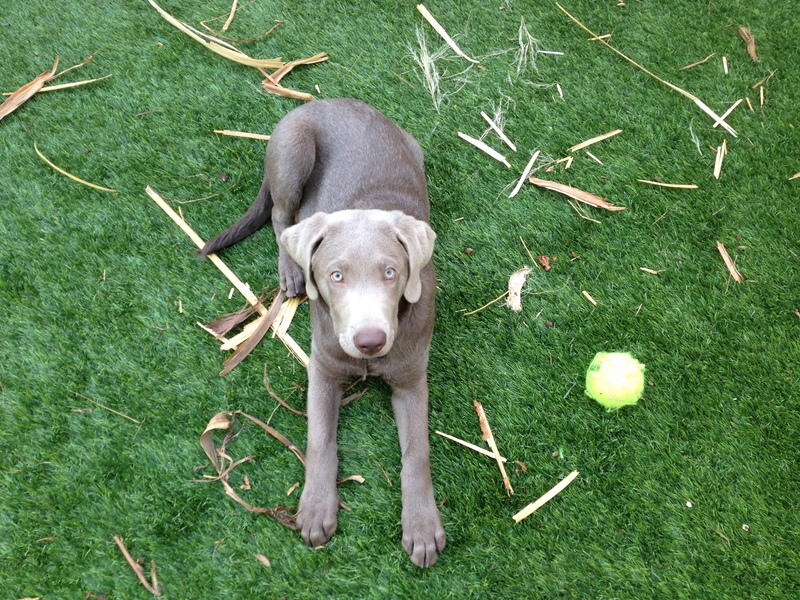 He is a silver Labrador Retriever and is now 3 1/2 months old. He is the sweetest, most adorable puppy in the whole wide world! But if any of you have had a puppy (especially a lab), you’ll know it’s a lot of work. You pretty much can’t take your eyes off them for at least the first month or you’ll end up with something completely shredded or peed on. The good news is he’s getting easier every day. He’s house trained now and has learned (mostly) what he is and is not allowed to chew. So I’ve been sneaking in a little bit of sewing here and there while he naps. I feel like I have a new baby again. 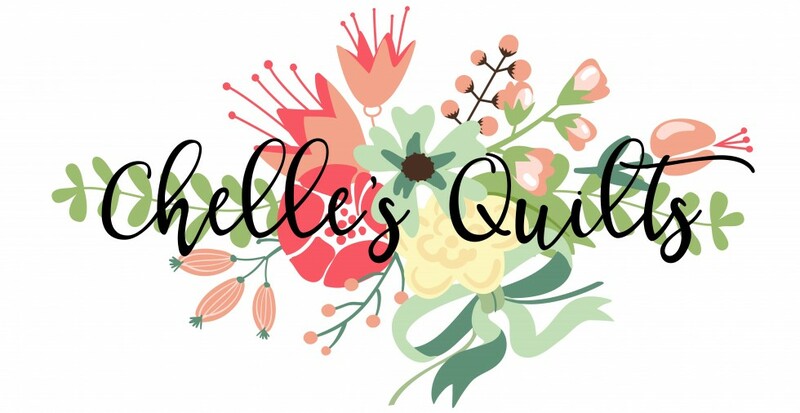 I decided that I needed to make a quilt and it needed to be simple and fast. 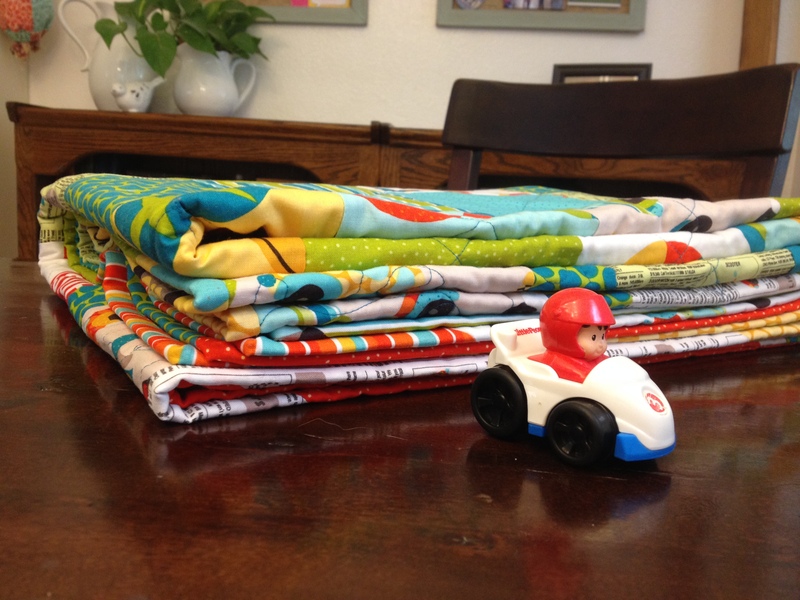 I’ve been hoarding a fat quarter bundle of “Peak Hour”, another great line of Riley Blake fabric (designer Kellie Wulfsohn). 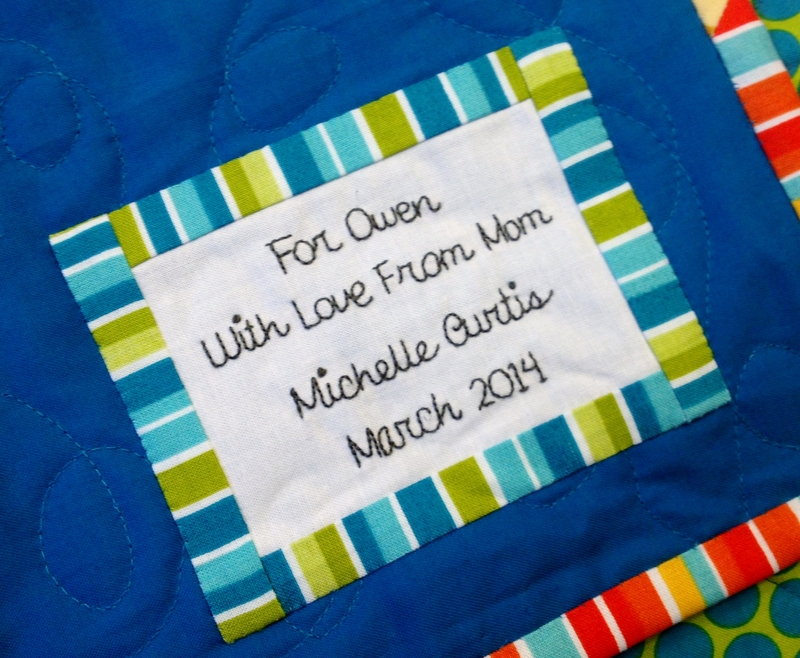 When I first started quilting there didn’t seem to be many lines of fabric with boy themes. I saw this one and had to have it! I just loved the bright colors and playful cars. 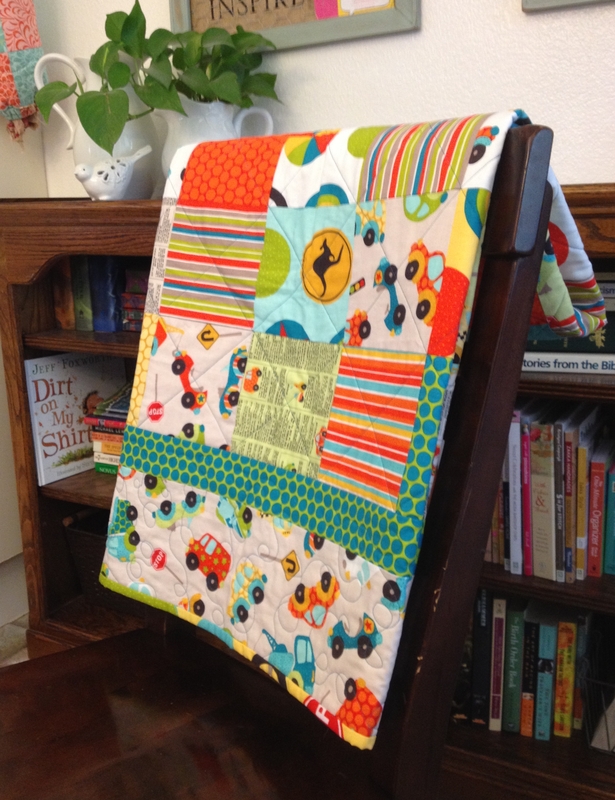 I bought this fat quarter bundle with the intention of making a quilt for my baby son, who is now 3. I really need to stop hoarding pretty fabrics and actually use them. They don’t get enjoyed sitting in my craft closet. I went with a very simple design. No pattern necessary and not a lot of thought at all. From start to finish this took me only a few days. Did you notice the kangaroo crossing sign in the aqua block? The designer is Australian. I love that she added that little touch. 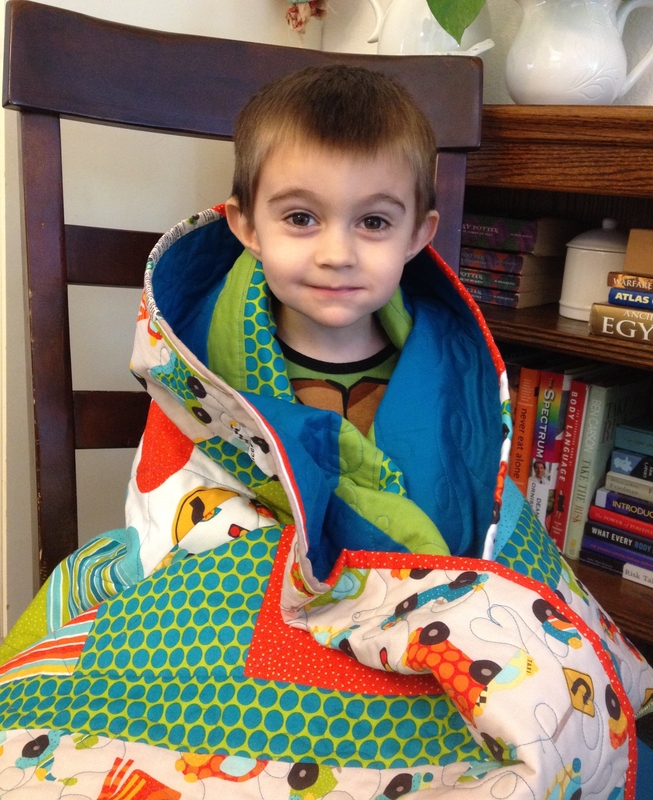 This little guy just loves it! I’ve been trying to get better about making labels. The first dozen or so quilts I made don’t have labels. It feels good to finish something again. I’ve already started on my next project. 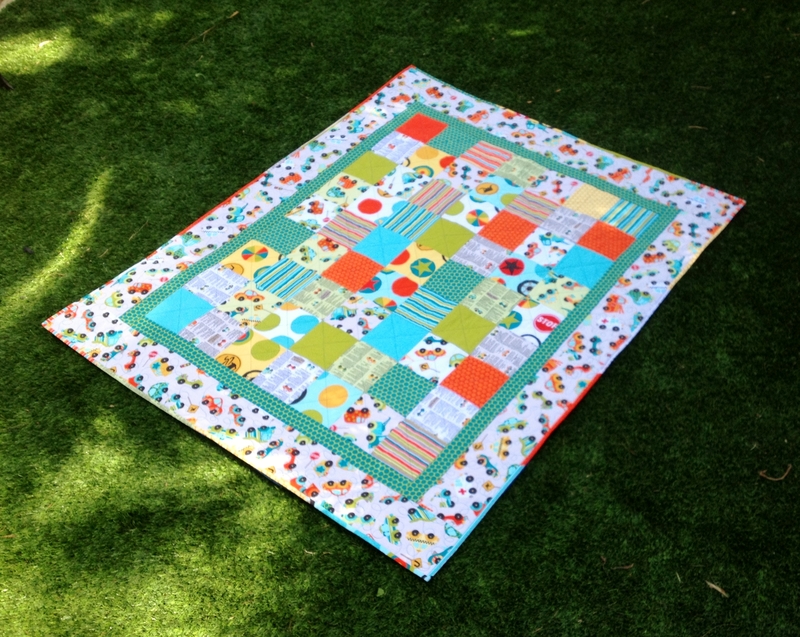 I’m doing a “Diamond in the Rough” quilt along with Freckeld Whimsy. It’s not too late to join, we just got cutting instructions. The more the merrier, come join us!